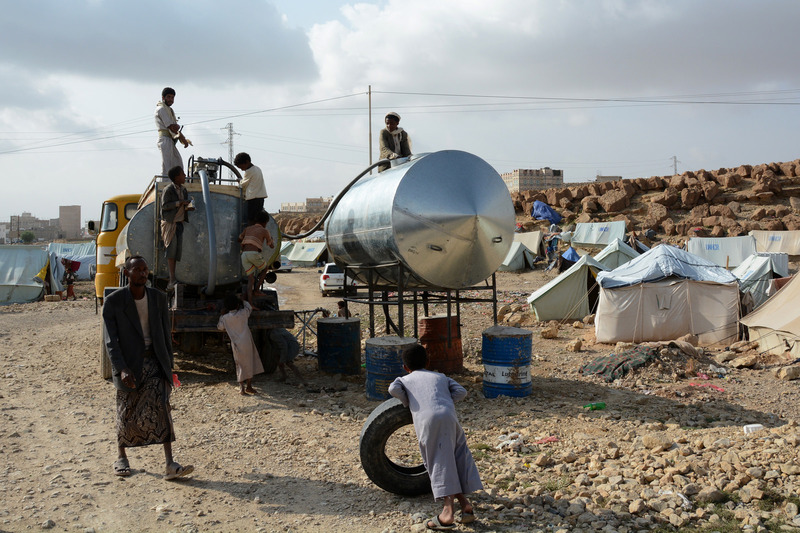 Yemen’s 2015 civil war has developed into a severe humanitarian crisis and has followed decades of instability in the poorest country in the region. While often portrayed as a binary conflict pitting Iranian-backed Houthi rebels against government forces supported by Saudi Arabia and the UAE, the conflict is instead a complex patchwork of state, non-state and tribal actors, where allegiances are flexible and where economic factors stemming from its war economy now underpin political and military interests. Yemen’s political instability undermined its capacity for environmental governance and led to the underdevelopment of its regulatory and enforcement systems. Environmental degradation was accelerating in response to demographic change and, prior to the conflict, issues such as uncontrolled hunting, dependency on wood for heating and cooking, Qat farming, over exploitation of water resources, land use changes and changing natural water flows were impacting biodiversity and degrading land. Yemen is one of the most water-stressed countries in the world. Nationally, water distribution systems were in poor repair and unsustainable groundwater pumping was increasingly favoured over rain water harvesting. During the conflict, water infrastructure has been targeted by all parties, and the loss of power, and access to parts for maintenance, has also impacted distribution systems and supplies. Government policies had served to increase the vulnerability of water supplies while sustaining inequalities in access that regularly resulted in localised conflicts in rural areas. Damage to water and sanitation infrastructure and disruption to the public health system has contributed to cholera outbreaks. From October 2016 to September 2017 cholera affected 797,772 Yemenis.1 Another contributing factor to cholera outbreaks has been the further degrading of Yemen’s weak waste management systems. Solid waste management was poor before the conflict and has been weakened further since 2015, creating health and environmental risks due to the improper separation and disposal of wastes. Before the current conflict, the majority of Yemen’s population lived outside urban areas, with more than half reliant on agriculture and animal husbandry. The conflict has had a severe impact on agriculture leading to widespread food insecurity. The cost of agricultural inputs, such as fuel and water, has dramatically increased leading to the abandonment of farms, triggering displacement from rural to urban areas and increasing the prevalence of animal diseases and crop pests. Agricultural infrastructure in rural areas has also been directly targeted by the Saudi-led coalition, as have urban grain stores: a breach of international humanitarian law.2 The problems have been made more acute by decades of inappropriate agricultural policies that had undermined the resilience of Yemen’s rural population and increased reliance on imported foodstuffs. Efforts by the UN to broker an end to the conflict have thus far been unsuccessful, and commentators have questioned their approach, which has not fully reflected the diverse number of factions now involved in the conflict, and their economic and political agendas.3 Meanwhile a blockade on ports by the Saudi coalition during 2017 has served to worsen food security further, risking famine. Environmental factors have been a key driver of the humanitarian crisis but while the conflict is ongoing, long-term interventions to address water and agricultural issues are limited. Activities to repair and improve water infrastructure, and increase its resilience, are being undertaken,4 as are finance schemes for farmers. Projects to improve waste management are also underway but are limited by the inadequacy of Yemen’s pre-conflict waste management architecture.